Are you all ready for this?! Could you possibly be hanging off the edge of your seat? If not why not. If so sit back relax don’t hurt yourself. If you have not surmised by now, we’re back baby! That is right my prolonged journey to the other side of the country is over. I’m in my new apartment with a wife a dog and a cat. We are all good happy and healthy. But best of all I get to work again! 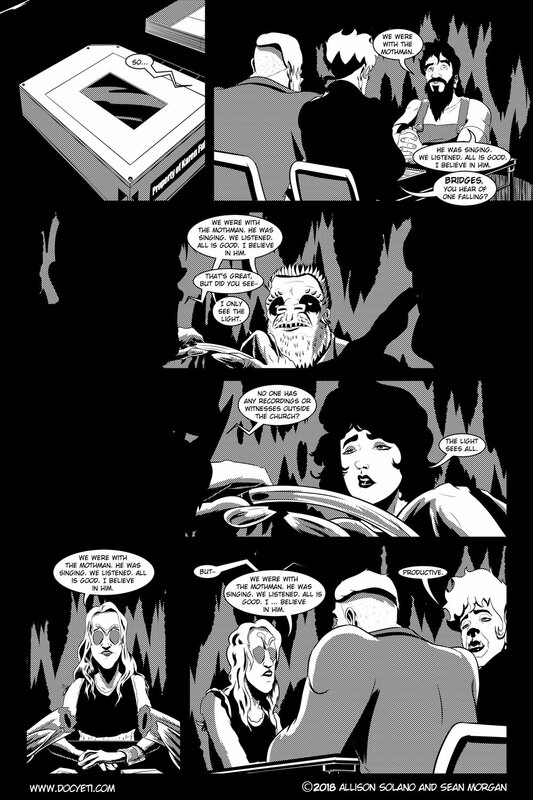 So here we are with page ten with Doc and JD interviewing the Mothman’s flock. See you Wednesday for page 11. As always please like and share this comic with your friends. Also, consider checking out our Patreon for some cool stuff plus it helps us make more of the comic we all love.